This beautifully illustrated, thoroughly researched and well-written book is much more than its title suggests. 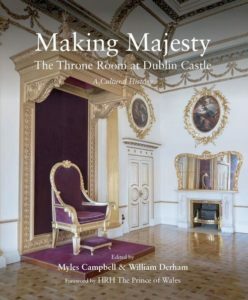 A fresh perspective is provided on the British administration of Ireland through a series of scholarly articles exploring previously untapped archival material to trace the evolution of the fabric of the ‘presence chamber/throne room’ and the State Apartments in Dublin Castle. The book is the fruit of an on-going multifaceted research project sponsored by the Office of Public Works on the unique and historically important castle complex from which Ireland was governed for centuries. A volume has already been produced on Francis Johnston’s Chapel Royal. Before the Act of Union, constitutional theory held that it was the common monarchy that bound the two kingdoms, though the political reality was that the viceroy was effectively the agent of the government in Whitehall. The State Apartments provided the setting for ceremonials associated with visits by King George IV, Queen Victoria, King Edward VII and King George V. The first presence chamber was located in a room next to the current throne room which was laid out in the late 18th century and refurbished for a visit by King George IV, including a singular throne which might reflect his particular marital circumstances. Due to the infrequent nature of Royal visits, the finely carved, gilded and richly upholstered throne, raised on a dais, in front of a cloth of state decorated with the royal arms, had added significance in conferring majesty on viceregal ceremonials. Jane Fenlon sets context for the evolution of presence chambers in royal palaces and the courtly settings created by the Duke of Ormond. A recurrent theme is the efforts of office holders from the 18th century onwards to source decorative and furnishing materials locally, notably in the case of the magnificent 1839 giltwood wreaths supplied by Cornelius Callaghan (1770-1845) of Clare Street to frame the previously overlooked mythologies now firmly attributed to Gaetano Gandolfini (1734-1802). Lady Aberdeen, who entirely overshadowed her husband, is remembered as a promoter of Irish industry and was a mover behind the pioneering establishment Peamont Hospital for the treatment of TB. Over 150 plates include comparative images of Windsor, Hampton Court, St James’s and Buckingham Palace. There is an impressive array of plans of the State Apartments at different periods, though it is a pity that they are not reproduced in a larger scale. Portraits are illustrated in their original frames, including several of the unique set of liveried frames of office holders surmounted by crests and coronets and Lely’s regal restoration portrait of the 1st duke of Ormond, a picture which amply illustrates the temptation for office holders to cross the line between representing majesty and personal presumption. Davison Associates have provided superb modern photographs of rooms as well as shots of details. Despite the removal, by various means, of royal statues, it is remarkable that the throne is in place today, particularly as a decision had to be taken to reinstate it following the room’s temporary use as a court of law and a significant reconstruction and reordering in the 1950s and 1960s. Appropriately a foreword by the Prince of Wales heralds a new age of rapprochement in Anglo-Irish relations which has encouraged a greater interest in the material history of British rule. The still potent symbolism of the throne room might have influenced the decision to locate a televised reception line for guests at the state banquet hosted by the President on the recent state by Queen Elizabeth II in the adjacent drawing room. It is admirable that the Office of Public Works is supporting such excellent scholarly research and future publications would be most welcome. It would be particularly interesting to know of the impact of two figures not mentioned in the current study, the first resident lord lieutenant, the 4th Viscount Townshend (1724-1807) and the 1st Duke of Dorset (1688-1765) who served two terms and whose lavish entertainments are known through van der Hagen’s depiction of St Patrick’s Hall and surviving wall hangings. A nice touch of verisimilitude in any further restoration work might be the restoration of the royal arms on the back cloth behind the throne – perhaps the Royal School of Needlework could be prevailed upon to oblige? John Coleman is a writer and is currently completing a biography of Charles Coote, Earl of Bellamont.